There were six series of Granada TV Sherlock Holmes adventures made between 1984 and 1994: two series of The Adventures of Sherlock Holmes (thirteen episodes), two series of The Return of Sherlock Holmes (eleven episodes), The Case-Book of Sherlock Holmes (six episodes) and The Memoirs of Sherlock Holmes (six episodes). Five feature-length special episodes, including adaptations of two of Sir Arthur Conan Doyle's four Sherlock Holmes novels (The Sign of Four, in 1987, and The Hound of the Baskervilles, in 1988), were also made, before star Jeremy Brett's untimely death ended the series. British fans of the Brett series have been lucky in that all of the adventures have been released on VHS (initially by various combinations of the Castle Hendring organisation, and later on Granada's own imprint, via VCI). Many episodes of the series have more recently been released on disc in the US, by MPI Home Video, and the entire series is available on DVD from Japan, at astronomical cost. Now the series has been released in the UK, on the Cinema Club label. Each single-layer disc contains two episodes, at budget price. The discs are also available in a complete series box set, offering a substantial discount. I wasn't at all impressed with the only MPI disc I sampled (the first one, featuring A Scandal in Bohemia, The Dancing Men, The Naval Treaty and The Solitary Cyclist). The series was shot on 16mm film. I'm quite familiar with the best existing PAL video transfers of the series (which were probably taken from the 1" analogue tape masters), and, even allowing for the reduced resolution offered by the DVD format, know that the MPI discs were a poor facsimile. That's not to say that the existing master tapes are terribly impressive. In the case of the early episodes the 16mm negative would have been transferred to tape in the mid-eighties. Telecine technology has improved dramatically since then, but returning to the film negatives, or even to film prints, is a very a costly exercise. VCI is one of the most frugal video companies operating in the UK, and by the time any product reaches their bargain basement Cinema Club range, spending more money than is absolutely necessary is not a consideration. In the case of the Sherlock Holmes series, the DVDs have been made from masters with inherently dull contrast, and soft image. Film flaws abound, including what would now be completely unacceptable amounts of film and negative dirt, sparkle and other flaws. Like most filmed TV from the era, there's also an annoying tendency for the film to twitch slightly on cuts. Various fleeting minor analogue video impairments are also present. Most, if not all, of these flaws could have been eliminated if the series had been properly remastered. All the episodes are presented in their original 1.33:1 (4:3) aspect ratio. (To be strictly accurate, because of the way the episodes have been mastered, they're actually in a ratio of about 1.28:1, but it makes little difference, because what's missing from the sides would normally be lost in the overscan of most domestic TV sets). The good news is that the transfer to DVD hasn't significantly degraded the picture quality. They're slightly softer than they perhaps could have been if a higher bitrate had been allocated to them, but there are rarely signs of MPEG artefacts. Contrast is often weak or excessively harsh, and black levels are often poor, but this is a fault on the video masters, and not something that has been introduced recently. Picture quality is marginally better than could be obtained by an ordinary domestic off-air recording. The UK discs have much more subdued hues than the American disc, offering a much more naturalistic appearance. Colour balance is also better on the UK discs, and they have less underlying chroma noise. The US discs have constant smeariness resulting from excessive video noise reduction, which isn't present on the UK discs. The average bitrate on each of the four MPI episodes was 5.6Mb/s. The four equivalent episodes on the Cinema Club discs have an average bitrate of 5.56Mb/s, but examination of graphs showing bitrate over time show that the Cinema Club discs have much higher peaks and much lower troughs, indicating more adaptive coding. There's no doubt that the UK discs are superior to the US disc available for comparison. The four episodes on the MPI disc suffered from horrendous audio wow and flutter (particularly on A Scandal in Bohemia and The Naval Treaty), which played havoc with Patrick Gower's mournful music. Dialogue frequently sounded choppy (this may have been the result of a sampling-rate error). The wow and flutter isn't entirely absent from the UK discs, but it isn't anywhere near as prevalent. The audio on the UK discs is Dolby Digital mono, presented in 2.0 format (at 192kbps). Dialogue is generally clear, if occasionally slightly sibilant. The Cinema Club discs are the very definition of "bare bones". They have only one menu screen, offering the choice of episodes (even though the episodes themselves are broken down into chapters, at apparently random six or seven minute intervals). The menu screen on each disc uses a photo' of Edward Hardwicke as Watson, even for the episodes that feature David Burke! 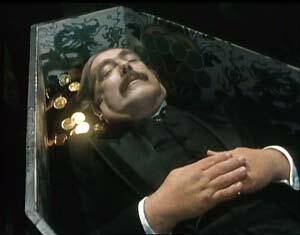 Purists will be disappointed - but not surprised, surely - to find that the episodes no longer have the Sidney Paget advert bumpers that graced the original UK transmissions. Some of the episodes have the old yellow and blue Granada logo at the head or tail, however. 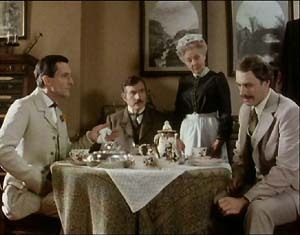 Holmes encounters "the woman", Irene Adler, in Jeremy Brett's first outing as the great detective. Adler is in possession of a compromising photograph which reveals her intimate relationship with the King of Bohemia, and threatens to destroy the King's forthcoming wedding. The episode is a rollicking start to the series, giving Holmes a formidable opponent and the opportunity to slip into disguise not once, but twice, as a swarthy groom, and a twittery clergyman (both very closely based on Sidney Paget's illustrations for The Strand magazine). Gayle Hunnicutt gives a charismatic performance as Adler, in what's actually a rather slim role, one that's certainly less substantial than many other female characters in the Canon. Adler's reputation is largely built on what others have to say about her: the part offers only a handful of lines and a few minute's of screen time. Wolf Kahler is rather stiff as the King, but no more so than may reasonably be expected. Paul Annett's direction is unremarkable, and marred by the use of cheesy starburst filter effects during the flashback sequences, but his contributions included two nice touches not found in the original story: the blindfolded orchestra, and Irene's gender-swapping nightclub visit (which foreshadows the later scene where Holmes, relishing victory on the steps of 221B Baker Street, is bid a good evening by a passing gentleman). This adaptation also adds a final piece of the jigsaw that doesn't appear in the original story: the scene showing Adler discarding the incendiary photograph into the sea. A Scandal in Bohemia was the fourth story to be filmed, after The Solitary Cyclist, The Speckled Band and The Naval Treaty. 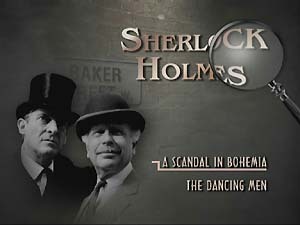 Many of Conan Doyle's original stories, including this one, take place after Watson is married, and living apart from Holmes, but for the sake of the series' internal continuity, this, and other, episodes are relocated to the time where Holmes and Watson are still sharing 221B Baker Street. The Dancing Men is one of the Canon's great tragedies, featuring a loving relationship torn apart by a secret from the past. The mystery of the dancing men (a row of cryptic figures chalked upon a garden bench, which causes great consternation to the mistress of the house) is one of Conan Doyle's slightest tales, but one that John Bruce and Anthony Skene have adapted beautifully. It could be argued that once any of the Holmes mysteries is explained to the reader - or viewer - it's subsequent appeal is diminished, but the appeal of the books - and TV episodes - rarely rests entirely on the plot alone. Kenyan-born Tenniel Evans is one of Britain's finest character actors, with dozens of notable TV appearances to his credit, in everything from The Avengers to The Liver Birds. Episodes of the hit comedy series The Navy Lark, which featured him as Abel Seaman Goldstein, have been airing regularly since the 50s. His appearance as the soft-spoken Hilton Cubitt doesn't disappoint. Fans of Red Dwarf's talking toaster are unlikely to recognise David Ross here (as Inspector Martin), but long-suffering fans of Granada TV's Coronation Street may remember Wendy Jane Walker (who plays the maid, Saunders) from her days as Ken and Valerie Barlow's daughter, Susan, who married Mike Baldwin in 1986. British actor Eugene Lipinski demonstrates his versatility as the villainous American Abe Slaney. His other credits include playing a Polish professor, a German clerk, a Czech guard and a Russian Cosmonaut! He also had a recurring role in the Canadian children's TV series Animorphs, and played a Todt worker on the run in the Enemy at the Door episode From a View To a Kill. A politically-sensitive, top secret document is mislaid, much to the distress of the Foreign Office clerk charged with its safe care. 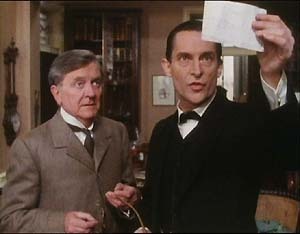 Sick with worry, the clerk, Percy Phelps, summons help from an old school friend, Doctor Watson. The plot presents an engaging whodunit, with several elements - like the mystery of who rang the office bell, and why - that will keep new viewers on their toes throughout. No wonder Holmes calls Phelps' case "one of the darkest I have ever investigated". There must have been much scratching of heads up and down the country, though, when Holmes veers off at a tangent with his poetic musings on a rose. Blink and you might miss the eldest of the Tangey children, who is played by Eve Matheson, who would gain a modicum of fame a couple of years later, playing Becky Sharp in the 1987 BBC adaptation of Vanity Fair (which, incidentally, was written by A Scandal in Bohemia's Alexander Baron). Pressure of time forced the episode's rather poorly staged shadow play finale between Holmes and the villain of the piece, with its decidedly odd insert shots. Nevertheless, it adds an unexpected kink to an otherwise straightforward episode. Most of the episodes on the Cinema Club discs are too dark, and this one is especially bad. Well-lit scenes are generally fine, but scenes set in shadow are mired in blackness. A young governess is stalked by a mysterious stranger in The Solitary Cyclist, which was the first story to be filmed. 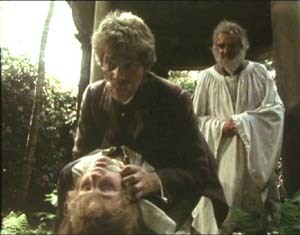 It's common practice that the first episode to be shot is rarely intended to be the first to air. This allows the production team a chance to iron out the bugs before making the episode which will be the first one that viewers - and critics - will see. Many members of the production team were already very experienced in making period drama, since they had previously worked on the detective series Cribb (the main difference was that Cribb was shot on video, and the Holmes series was shot on film). The Solitary Cyclist was selected as the first episode to go into production by producer Michael Cox, who saw it as an archetypal Holmes story. Cox credits John Castle with establishing the tone that the actors should take when, as was often the case, they had somewhat archaic dialogue to deliver. Castle's performance as Bob Carruthers is exemplary, but his character is dull. His shameful admission that he lost Violet to Woodley in a card game provides a moment of poignancy. Far more entertaining is the leering Jack Woodley, played by Michael Siberry. 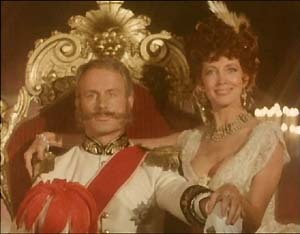 Siberry would return to the Holmes universe in the 1990 TV movie Sherlock Holmes and the Leading Lady, playing Franz Winterhauser in another version of Conan Doyle's A Scandal in Bohemia. Pay close attention to the scene where Violet's stalker mysteriously disappears, like a pantomime genie, in a puff of steam from a train passing under a railway bridge. In reality there was no train - not even any tracks - and the illusion was created using smoke and sound effects! This episode contains a minor audio snit, and unusually clumsy edits where the advert breaks used to be. This disc contains the rather unfortunate pairing of the final episode from the 1984 season of The Adventures of Sherlock Holmes (The Blue Carbuncle) with the fourth episode of the 1985 season of The Adventures of Sherlock Holmes (The Resident Patient). Veteran TV Producer John Hawkesworth is credited with establishing the house style for the Granada Holmes episodes, which often opened with a teasing flashback scene that would establish elements of the mystery to follow. 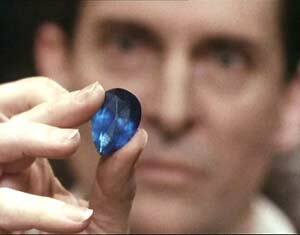 Perhaps none is more memorable than the one for The Blue Carbuncle, thanks in part to Paul Finney's use of the fabled Blue Carbuncle itself to vignette snapshots of the Chinese gemstone's troubled history. The jump cut from a young, happy woman being presented with the stone to her present, more troubled countenance is an especially nice touch. Most of this sequence was the invention of Paul Finney, extrapolating from Conan Doyle's story to provide a very dramatic first act. Finney, incidentally, is a pseudonymous credit for a writer who chose not to be credited after being unhappy with some of the changes that Hawkesworth had made to his script. The Blue Carbuncle continues in much the the same vein, including a couple of terrific scenes between Holmes and Watson: the first as Holmes deduces Baker's character and personal details by studying his discarded bowler hat; the second his sly questioning of its owner. The episode is packed with winning performances, including those by Ken Campbell as the scheming footman James Ryder, Ros Simmons as his partner-in-crime, Desmond McNamara as plumber John Horner and Rosalind Knight as the imposing Countess of Morcar. Frank Mills, a well-known face from his recurring roles in three popular TV series (as Frank Rudd in Nanny, Fig Newton in Rumpole of the Bailey, and Frank Wainthropp in Hetty Wainthropp Investigates) plays Petersen beautifully, but is overshadowed by Frank Middlemass, as the impoverished Henry Baker and Eric Allen as Breckenridge, the belligerent Covent Garden poultry dealer. If there's one criticism to be leveled at the episode, it would be about Patrick Gower's syrupy Christmas carol-tinged score. Gower's music, one of the key strengths of the series, is somewhat irritating in this episode. Watch carefully the shot where Ken Campbell feeds the jewel to the goose, and you might spot him slyly palming the stone in his other hand! Many of Conan Doyle's best Holmes stories feature a protagonist who is unwittingly participating in a fiendish plot. When their suspicions are finally roused, they inevitably seek advice from Sherlock Holmes, which is generally where we join the story. The Resident Patient is an archetypal example: a talented young doctor is lifted from poverty by an apparently benevolent patron, who has his own dark motives for this munificence.